Craving Waffle House or In-N-Out Burger in Philly? Here are the closest locations! The Waffle House location in Elkton, Maryland is one of the chain's closest to Philadelphia. 'Twas early October when me and my family were traveling home from Baltimore and saw that yellow highway sign that spoke to a breakfast-style culinary oasis in our immediate vicinity. Yes, I’m talking about Waffle Houses located everywhere else EXCEPT Philly, which is a travesty for those of us who like our grits cheesy and our hash browns smothered, covered, chunked, diced and peppered. We stopped. We dined. We tipped our server Jamie for exemplary service amid a crowd that stretched outside the front door since one of her peers had gotten hurt and had to leave mid-shift. And then, we returned home, some 40 miles from the closest Waffle House locations. 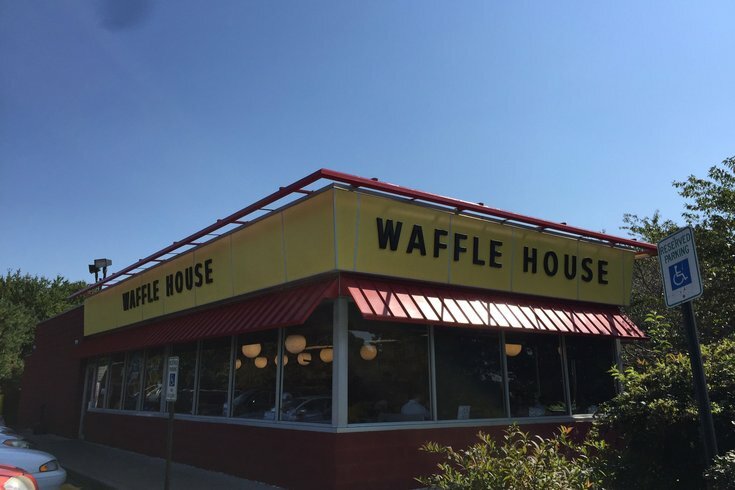 Making matters worse is how Waffle House spokesman Pat Warner told me "that in the short term, we don't have Philly targeted" for an opening, thought "I think it would be a great market for us, and I'm sure we will get there someday." A recent survey looked into the most in-demand fast-food chains across America. Chick-fil-A, which isn't rare 'round these parts, took top honors, followed by Dunkin Donuts and Subway, which is just flat-out weird considering the wide world of quick grub out there tempting your tastebuds. Upon sharing this tale of Waffle House woe with colleagues at PhillyVoice World Headquarters, I learned we were not alone. There are many, many dining experience not immediately available to us in the food-rich city and region. In the name of public-service journalism, below is a list of many U.S. restaurants – including In-and-Out Burger and White Castle – along with hyperlinked directions to the closest location to Center City. That way, if you’re among the millions of people who hit the road for Thanksgiving weekend, you may find yourself near one to cleanse your palettes from a month of leftovers. If we missed any of note – of if you know a location closer than we were able to find on the chains’ websites – please add them in the comments or send via email so we can include them.